Inspiration to write has been lacking. Inspiration in my crafts has been lacking. In short, I think I hibernated a bit this winter. It's odd, really. Winter should be when i am crafting most - it's cold outside and generally conducive to staying home and all that, but rarely does it happen. The cardigan I started in April? Still going. I have a sleeve to go, then I have to sew it up and edge it. Still no photos. 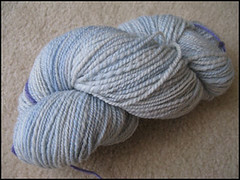 It's just stocking stitch, so imagine a pile of stocking stitch pieces in this yarn and colour. The Woodland Shawl I started... um... a long time ago hasn't really grown at all. It is next on the list of WIPs to complete. Socks I was working on have been frogged and a new pair started. They haven't progressed that much either. 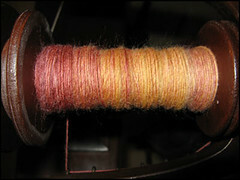 In keeping with the hibernation theme: the pink merino I've been spinning on my spindle hasn't gone anywhere.